Alien Hominid is an independently developed run and gun video game developed by The Behemoth. The game was developed from a Flash game originally released on Newgrounds in August 2002. O3 Entertainment released the game for PlayStation 2 and GameCube in North America in 2004, whilst ZOO Digital Publishing released the game in Europe for PlayStation 2, Xbox, Mobile phones and Gizmondo in 2005. The Xbox version is not compatible with Xbox One. A port for the Game Boy Advance, co-developed by Tuna Technologies, was also released in Europe in 2006. A high-definition version titled Alien Hominid HD was released for Xbox Live Arcade on February 28, 2007. The game is a side-scrolling shooter in a similar vein to games like Metal Slug, where one hit instantly kills, and can be played simultaneously with one or two players. Players play as the titular hominid, who has to fend off waves of secret agents. His main arsenal is a blaster, while players can also melee close-up enemies and use a limited number of grenades. Advanced moves include rolling under shots, jumping on and biting off enemies' heads, temporarily scaring other enemies, and digging underground to drag enemies down with them. Players can collect a variety of power-ups which simultaneously give players extra grenades, a shield, and unique ammo. Players can also drive vehicles, ride on top of an Yeti, and pilot a UFO. Completing certain tasks will unlock hats the players can dress their Hominid in. The main game features sixteen stages spread across three areas: Urban, Russia, and Area-51. Outside of the main game, there are three multiplayer modes (Challenge, Neutron Ball, and Pinata Boss), a PDA game (featuring around 200 levels and a level editor), and a retro minigame, Super Soviet Missile Mastar. The PAL version contains an extra mode, All You Can Eat, while the PDA level editor is absent from the XBLA version. When the PAL version was developed for Europe in 2005, a number of new features were added. 25 levels built by U.S. fans were added to the 200 level PDA Game. A "replay rewind" function was added to single-player allowing play at any point in a level. A brand new 2-4 player mini-game called "All You Can Eat", featuring the Fat Kids, was made exclusively for the PAL version. It is a button masher where you have to eat all of the food in front of you to win. This idea was later re-used in The Behemoth's next game, Castle Crashers, under the title "All You Can Quaff". A glitch in level 3-5 that allowed a player to get massive numbers of points was removed. Alien Hominid began as a flash game developed by programmer Tom Fulp and animator Dan Paladin, which was released on Newgrounds in August 2002. It's often referred to as the Alien Hominid "prototype" by The Behemoth. Inspired by side-scrolling shooter games such as Metal Slug, the flash game features a little yellow alien who has crash landed on Earth and must fight through countless corrupt, bloodthirsty FBI agents striving to capture him. The game consisted of one level containing two bosses, who would later reappear in the retail version. It became very popular among the online gaming set and has currently been played over 20 million times. Later in the year, then-co-worker John Baez approached Paladin as a fan of Alien Hominid. He suggested that Paladin and Fulp make a console version of the game, even offering to produce the game. Both Paladin and Fulp agreed with his idea, forming The Behemoth. In the course of two years, Alien Hominid became a much larger project than its online prototype. While 3D graphics were considered initially, The Behemoth decided nothing compared to the traditional 2D stylings of the prototype. The art of Paladin, who drew all visual aspects of the game by hand, became much more refined (though still cartoon-like and inviting). The project was entirely re-coded for consoles, and many new gameplay features were created. Matt Harwood of Petrified Productions, who had previously worked with Paladin, created all of the music for the game. DJH has been credited with extensive play-testing, citing Alien Hominid as "the pinnacle of arcade entertainment". Even before its release, Alien Hominid received notice in gaming magazines such as Play, GMR, Edge, Dragon, and even popular non-gaming magazines such as Wired. In reviews for the game, it was critically acclaimed for its old-school style gameplay, tough level of difficulty, and quirky humor. The game also won many small awards, most notably at the Independent Games Festival (for Innovation In Visual Arts, Technical Excellence and the Audience Award). Copies of the game are sold primarily through its online website, www.alienhominid.com, for ten dollars (American). The website also offers merchandise such as skate decks, T-shirts and action figures. The website was developed by Tom Fulp. 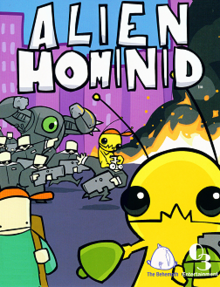 Alien Hominid became one of the games spoofed by Mega64 on June 3, 2008. Hominid appears during one of the levels in The Behemoth's 2nd game, Castle Crashers, using a lance weapon based on his ray gun. He is playable to anyone who has also downloaded Alien Hominid HD on the XBLA version, while he is unlocked by completing said level on the PlayStation Network and Steam versions of the game. The green eyeball from an early boss fight also appears as an Animal Orb, firing lasers at enemies. Hominid appears as a playable character in Team Meat's Super Meat Boy, another game that originated as a flash game on Newgrounds. The Super Soviet Missile Mastar minigame from Alien Hominid was released as a free app for iOS on February 7, 2011. An improved version of the PDA Games minigame was released for iOS on December 9, 2011. Developer Tom Fulp has cited the PDA Games as being the inspiration for The Behemoth's third game, BattleBlock Theater, which features unlockable Hominid character heads for those who own Alien Hominid HD. The game received "generally favorable reviews" on all platforms except the Game Boy Advance version, which received universal acclaim, according to the review aggregation website Metacritic. ^ Webber, Scott (July 20, 2006). "Alien Hominid coming to the Live Arcade". Console Monster. Archived from the original on July 22, 2012. Retrieved July 15, 2016. ^ Dunham, Jeremy (February 18, 2005). "Alien Hominid PAL Exclusives". IGN. Retrieved July 15, 2016. ^ Mega64 (June 3, 2008). "Mega64: Alien Hominid HD Commercial". YouTube. Retrieved July 15, 2016. ^ Revak, Kelly (January 11, 2011). "Super Soviet Missile Mastar controls your iPhone/iPad". The Behemoth. Retrieved July 15, 2016. ^ Revak, Kelly (February 7, 2011). "Super Soviet Missile Mastar launch is GO". The Behemoth. Retrieved July 15, 2016. ^ a b Fulp, Tom (December 9, 2011). "Go Get PDA Games for iPhone / iPad!". Newgrounds. ^ The Behemoth (April 2, 2013). "Special Unlocks in BattleBlock Theater and Castle Crashers XBLA". YouTube. ^ Gillen, Kieron (June 14, 2005). "Alien Hominid (Xbox)". Eurogamer. Retrieved July 16, 2016. ^ Reed, Kristan (February 28, 2007). "Alien Hominid HD". Eurogamer. Retrieved July 16, 2016. ^ a b Liu, Johnny (December 28, 2004). "Alien Hominid Review (GC, PS2)". Game Revolution. Retrieved July 16, 2016. ^ Davis, Ryan (November 18, 2004). "Alien Hominid Review (GC)". GameSpot. Retrieved July 16, 2016. ^ Stuart, Keith (June 15, 2005). "Alien Hominid Review (Mobile)". GameSpot. Retrieved July 16, 2016. ^ Davis, Ryan (November 18, 2004). "Alien Hominid Review (PS2)". GameSpot. Retrieved July 16, 2016. ^ Gerstmann, Jeff (March 1, 2007). "Alien Hominid HD Review". GameSpot. Retrieved July 16, 2016. ^ Schiaparelli, Frank (November 19, 2004). "GameSpy: Alien Hominid (PS2)". GameSpy. Retrieved July 16, 2016. ^ a b Sulic, Ivan (November 9, 2004). "Alien Hominid (NGC, PS2)". IGN. Retrieved July 16, 2016. ^ Brudvig, Erik (March 1, 2007). "Alien Hominid Review (X360)". IGN. Retrieved July 16, 2016. ^ "Alien Hominid (GC)". Nintendo Power. 187: 138. January 2005. ^ Davison, John (January 2005). "Alien Hominid". Official U.S. PlayStation Magazine. Archived from the original on August 16, 2016. Retrieved July 15, 2016. ^ "Alien Hominid HD". Official Xbox Magazine: 74. February 2007. ^ "Alien Hominid for Game Boy Advance". GameRankings. Retrieved July 15, 2016. ^ "Alien Hominid for GameCube". GameRankings. Retrieved July 15, 2016. ^ "Alien Hominid for Mobile". GameRankings. Retrieved July 15, 2016. ^ "Alien Hominid for PlayStation 2". GameRankings. Retrieved July 15, 2016. ^ "Alien Hominid for Xbox Reviews". GameRankings. Retrieved July 15, 2016. ^ "Alien Hominid HD for Xbox 360". GameRankings. Retrieved July 15, 2016. ^ a b "Alien Hominid (gba: 2006): Reviews". Metacritic. Archived from the original on September 13, 2008. Retrieved July 15, 2016. ^ a b "Alien Hominid for GameCube Reviews". Metacritic. Retrieved July 15, 2016. ^ a b "Alien Hominid for PlayStation 2 Reviews". Metacritic. Retrieved July 15, 2016. ^ a b "Alien Hominid (xbx: 2005): Reviews". Metacritic. Archived from the original on September 13, 2008. Retrieved July 15, 2016. ^ a b "Alien Hominid HD for Xbox 360 Reviews". Metacritic. Retrieved July 15, 2016. This page was last edited on 12 October 2018, at 13:33 (UTC).